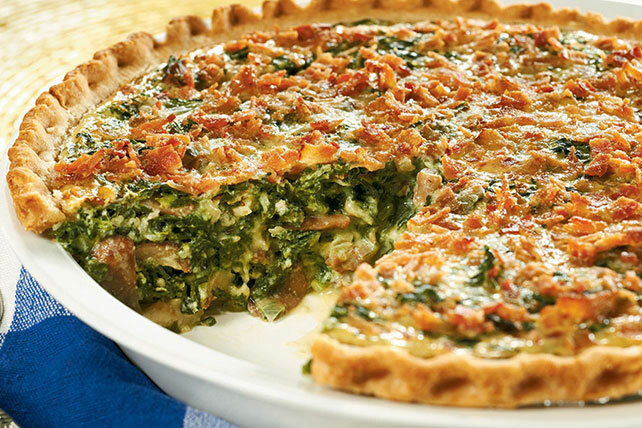 Make your evening simple with our Weeknight Quiche Recipe. This cheesy, easy quiche recipe requires only 15 minutes of total prep time. Cook mushrooms and onions in large nonstick skillet sprayed with cooking spray on medium-high heat 5 min. or until crisp-tender. Remove from heat; stir in spinach. Whisk eggs, milk and dressing in medium bowl until blended. Add spinach mixture and cheese; mix well. Pour into crust; sprinkle with bacon. Bake 50 min. or until knife inserted in center comes out clean. Serve this easy-to-make entrée with a mixed green side salad tossed with your favorite KRAFT Lite Dressing, a whole grain roll and fresh fruit for dessert. Prepare using MIRACLE WHIP Light Dressing and KRAFT 2% Milk Shredded Mozzarella Cheese. Transfer frozen pie crust from foil pan to pie plate before filling as directed. A slice of quiche, served warm or cold with a tossed salad, is a perfect lunch to take to work the next day. Place spinach block in colander in sink. Run hot water over spinach until thawed; press out any excess liquid.